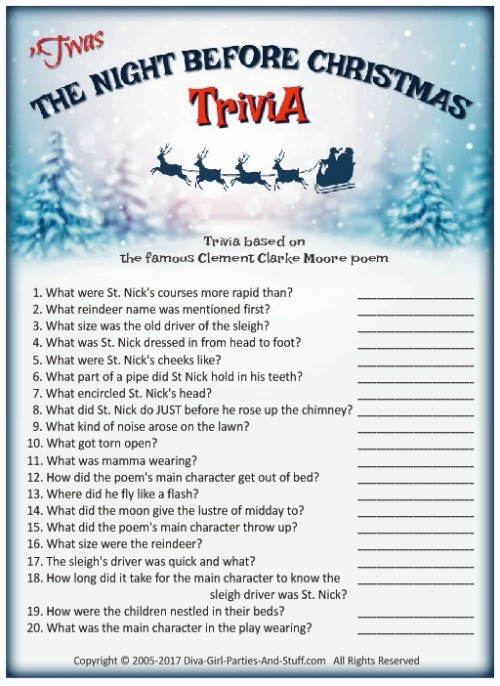 So you think you know Clement Clarke Moore's famous poem? Think again. 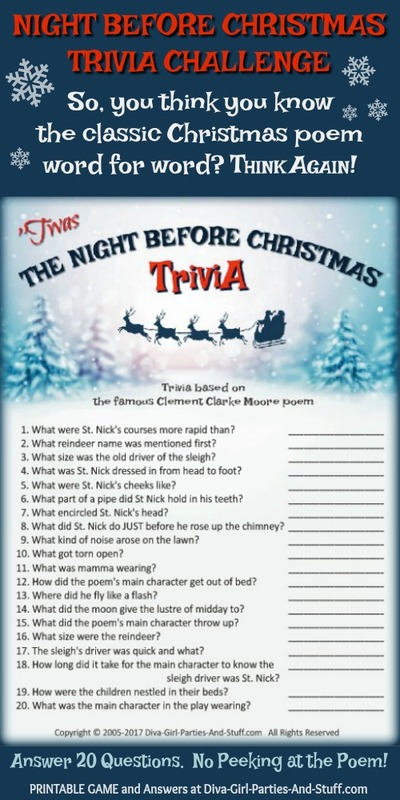 This Night Before Christmas trivia will seriously challenge your memory of the lines we hear repeated year after year. A printable copy of this game and the answers is available below. 1. What were St. Nick's courses more rapid than? 2. What reindeer name was mentioned first? 3. What size was the old driver of the sleigh? 4. What was St. Nick dressed in from head to foot? 5. What were St. Nick's cheeks like? 6. What part of a pipe did St Nick hold in his teeth? 7. What encircled St. Nick's head? 8. What did St. Nick do JUST before he rose up the chimney? 9. What kind of noise arose on the lawn? 10. What got torn open? 11. What was mamma wearing? 12. How did the poem's main character get out of bed? 13. Where did he fly like a flash? 14. What did the moon give the lustre of midday to? 15. What did the poem's main character throw up? 16. What size were the reindeer? 17. The sleigh's driver was quick and what? 18. How long did it take for the main character to know the sleigh driver was St. Nick? 19. How were the children nestled in their beds? 20. What was the main character in the play wearing? Answers to the above trivia underlined in the poem below to provide context for the answers.